Gum Disease Treatment involves proper diagnosis with a dental instrument called a periodontal probe. The periodontal probe will be used to measure the depth of the pocket between your teeth and your gums and then an x-ray for a more precise evaluation of your gum disease condition. A procedure called deep cleaning that involves scaling and root planing may be required although in some cases a simple cleaning may be the solution. Afterwards, a gum maintenance schedule is modified to fit your needs. 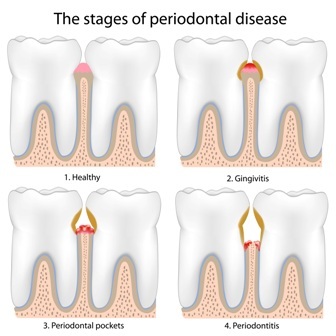 Gum Disease is also known as Periodontal Disease. It is an infection that has developed in the tissues of your teeth. Plaque buildup and tartar deposits caused by improper dental and oral care are the main causes of gum disease. Having gum disease will cause your gums to bleed, get inflamed and infected. You will feel the gradual pain as the periodontal gum disease worsen until the need for professional gum disease treatment from a reliable dentist comes up. Palm Bay dentist Dr. Quadri provides primary care for periodontal/ gum disease and will give your gums a thorough exam for a customized treatment. In our Palm Bay General Dentistry, you are assured of accurate and customized treatment. More than that, whatever your dental need, we will be able to give you the best possible service in a very relaxed environment. So if you need a FREE consultation regarding possible gum disease treatment, just give us a call and we will discuss whatever dental concern that is troubling you. Our goal is to help you keep your teeth for a lifetime. That is why we always suggest that you have exams of this kind in your regular oral health check-up. Call our dental office in Palm Bay for a free estimate at 321-312-3040.